Consider this: decisions about surfaces and inscriptions belong to the surfaces and the inscriptions. Their makes, materials and messages are agents of influence and determination, and direct human intervention is only one of the forces that shapes the surface ensemble. It follows naturally that an ethnography of inscriptions and surfaces can be just as interesting as a study of human intentionality. The science of signs recognised this as well, when it proposed to examine not who stencilled that portrait on that door, or why they did it, but to look at how the stencil occupies its space: is it comfortable, does it live in chromatic surface harmony, does it show signs of rushed execution or weathering, are there immediate threats or competitors trying to claim its space? Ask the questions of the sign and of the space – and you create a complex surface ethnography of non-human subjects that can be adapted to a multitude of spaces. 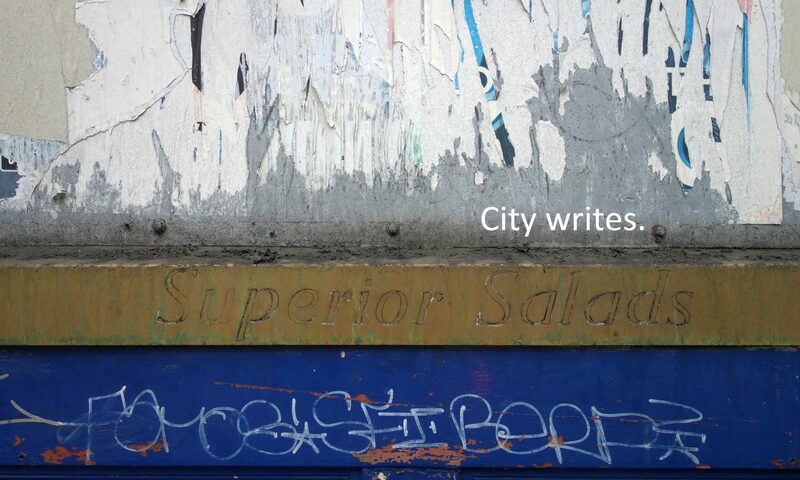 Surfaceality, verticality, materiality, visibility, text and image – they are all interpretive parameters to start from. The wall interviewing process is a speculative exercise that could be taken up on another occasion and developed to the full extent of its potential. It lays latent in my investigation, through my photographic and interpretive process, and hints at questions about tangible and intangible territories, patterns of occupation, independence or appropriation etc. Where are you? Are you wanted? Who else is there with you? Are you strong? What are your main selling points? Do you conform? How are you vulnerable? Are you anywhere else? What are you trying to say? Do you matter? One need not look further than the surface to find the answers to all these questions.